Making its debut at the Southern Model Show at Headcorn near Ashford Kent this weekend our new Autostart system for the popular NGH 38cc 4 stroke engine. With a revised engine mount and the Autostart system it transforms this unit into a very compact super smooth starting and operating engine which will find favour with Scale Modellers for sure. Please note Propguy is the only Official Factory supported UK Distributor of EME engines. 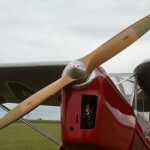 and MWM Warbirds the only Official UK Distributor supported Stockist. 'Distributors' of EME engines and auto start systems. We cannot accept warranty claims or provide service and spare parts from such sources. We will not support illicit business and or products coming from via Grey imports or dubious sources. Accept no fakes or imitations! Buy from a Authorised Dealer and get 18 months warranty! 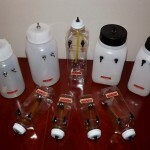 Flowmax are set to add a 12 oz lightweight (clear) tank to their already very successful range. As per the norm the tanks will be available to suit all applications, I.e. Petrol, Glow, Smoke, Jet A1 etc. Stock is due the first week of June and you can pre- order on the website now! We now have the complete range of Flowmax Fuel System fuel tanks in stock to compliment the very successful Danhakl range. Flowmax tanks differ in that they will tolerate all known Petrochems, this means we can now supply tanks for every application, Nitro/Glow, JetA1/Kero, Smoke fluids and of course petrol. Tanks come in either the clear Lightweight or Heavy Duty, a wider range of shapes and sizes and are competitively priced, full details on the website coming very soon! The long awaited ‘Classic’ prop from Falcon has just arrived and pre orders are now being shipped. Falcon are the first and only manufacturer to produce a propeller of this style ready finished. The Classic prop like all the range comes meticulously painted, finished and pre-balanced ready to bolt straight on. Perfect for your Tiggie or Golden age model. Supplies of this first batch are going quickly so grab get yours now. Sizes are presently limited but will be expanded very soon starting at 16in diameter through to 30in. Please see the shop for the current inventory. The Extreme Flight World Championships in Muncie Indiana was won by Seth Arnold, second place went to Daniel Holman with Gabriel Altez third. All three flyers relied on Falcon Props to claim their victories. In fact it was not only the sponsored pilots who trusted Falcon Props more than 60% of this years competitors bolted on Falcon Props! We are pleased to bring you news of an incredible expansion in the size availability of both the Beechwood and Carbon range of propellers. In line with Falcons Props ongoing commitment in developing the product range in that approximately 40 more prop sizes have been added. This will cater for the increasing number of new capacities introduced by engine manufactures that are now available, the additional new prop sizes are as follows. Beechwood: 12x4, 12x8, 13x4, 13x6, 14x8, 15x6, 17x10, 19x8, 20x12, 20x15, 21x10, 22x12, 23x12 and 36x12. Carbon Petrol/Nitro: 17x6.5, 18x6.5, 18x10, 18x11, 19x8, 20x9, 20x11, 20x12, 22x11, 22x12, 23x9, 26x11, 26x12, 26x13, 27x9W, 27x11, 27x12, 28x9W, 28x9.5, 29x9, 30x12, 31x14, 32x12 and 33x11W. These props should be available in limited numbers within the next few weeks, please pre-order to secure you requirements. Additionally we can expect some new Electric Carbon sizes and some three blade Carbon availability in the near future.